I’ve never actually had a Valentine’s Day party in my home before, but I think it would be a lot of fun. 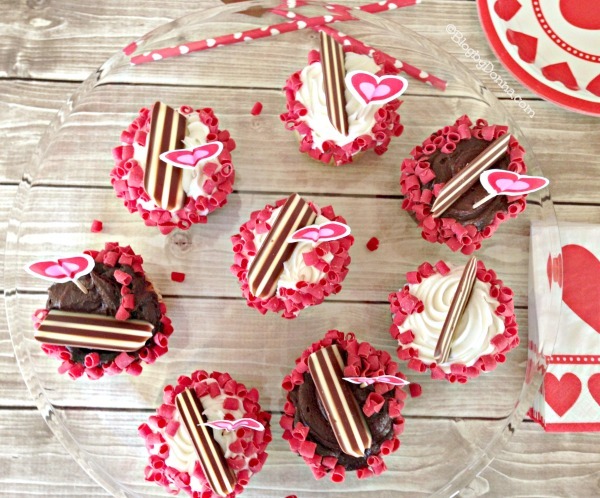 I decided to give myself a Valentine’s Day party challenge and see what I could throw together quickly and cheaply. 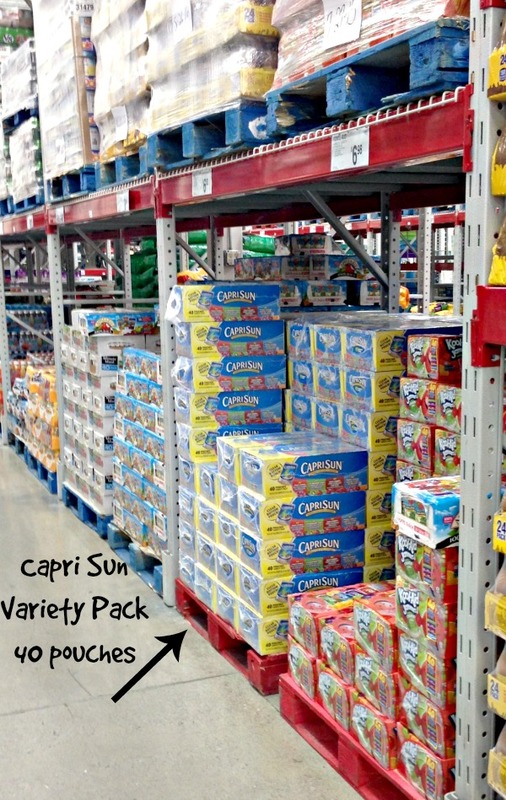 Then I went to Sam’s Club to pick up some Capri Sun Variety Pack 40 pouches. 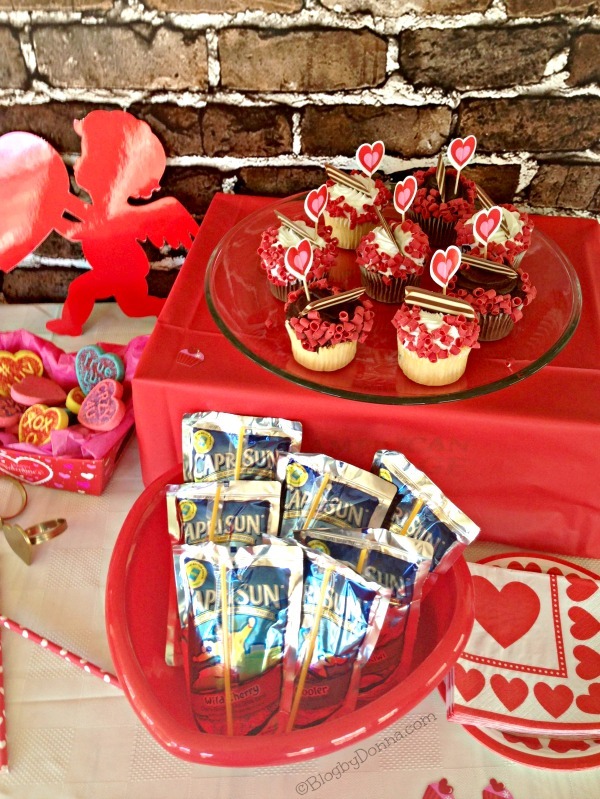 My son (who is 12) and his friends love Capri Sun, so that will make the perfect drink for my Valentine’s Day party. I love getting Capri Sun at Sam’s because you can get enough so you will have plenty for a party and I love the variety pack so everyone can have their favorite flavor, whether it’s Pacific Cooler, Fruit Punch, Strawberry Kiwi, or my personal favorite, Wild Cherry. Plus, the price is awesome! The best reason to have Capri Sun Variety Pack 40 pouches though, is NO artificial sweeteners, colors, flavors, or preservatives and reduced sugar (25% less sugar than other leading juice drinks). I like the clear bottom pouch so you can ‘see the goodness’, too. I decided on heart-shaped ham and cheese sandwiches and heart-shaped cheese on crackers. 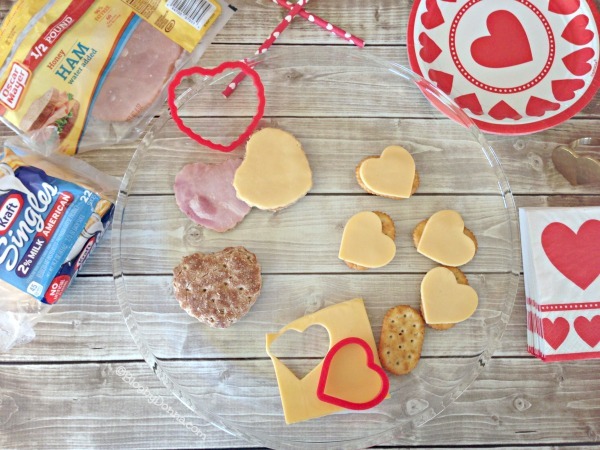 It’s quick and easy, everyone loves cheese, and I already have heart-shaped cookie cutters. You can’t have a Valentine’s Day party without some sweets… for dessert I will be serving cupcakes and conversation hearts sugar cookies. Next up on my list was a craft. 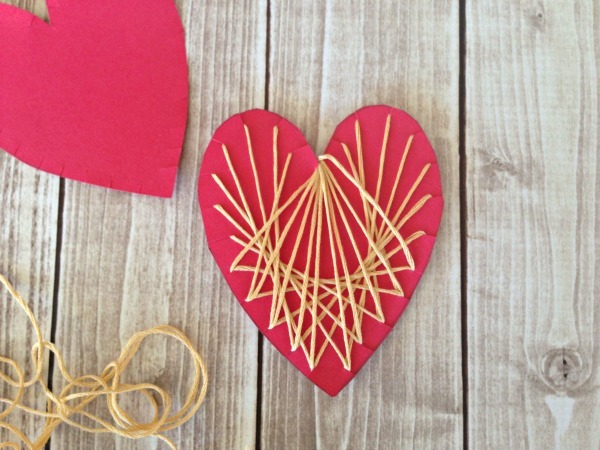 I already had everything I needed for a string art craft since it was a project I did with my son’s 5th grade class last year for his class Valentine’s Day party. I like to call this craft…. 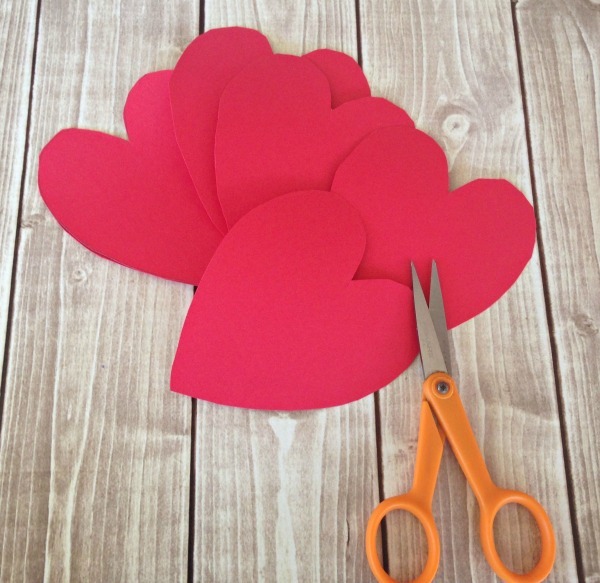 Cut hearts out of the red construction paper. 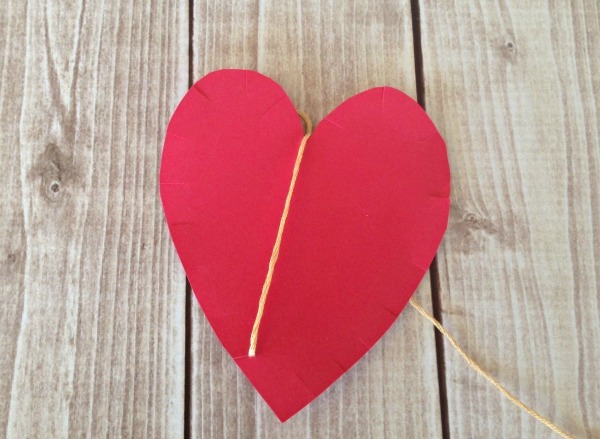 You can print out a heart online for a stencil or draw one free hand. 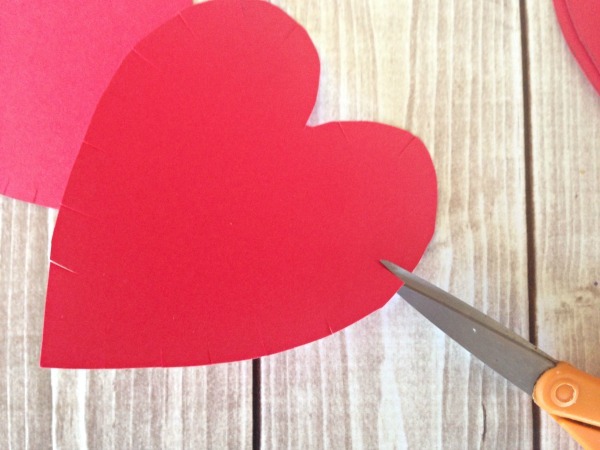 You should be able to cut 4-6 hearts per 8.5 x 11 sheets of construction paper. After you’ve cut your hearts you will take your scissors and make small cuts around your entire heart about a half inch a part. 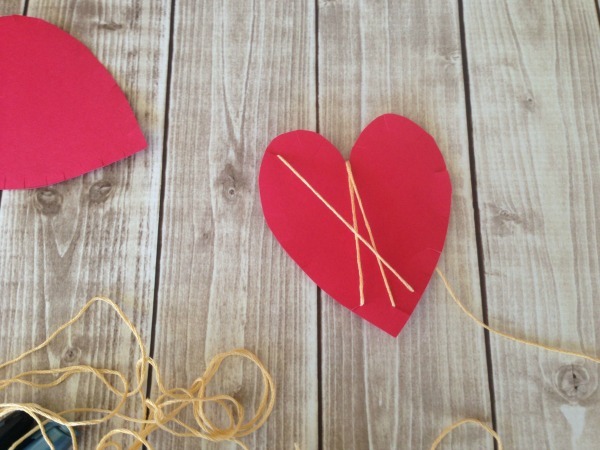 Take your gold string and cut about 24-36 inch length pieces to go with however many hearts you cut out (depending on how many kids are coming to your party). Take the string and start at the cut closes to the center/top of your heart (leave a little bit of string at the back of your heart. Then go to the opposite side of your heart to and thread your string through the cut and around the back to the opposite side of the heart and so on, and so on. Now take your card stock and fold it so it is a card. I already had some pastel colors, so I used blue and pink. 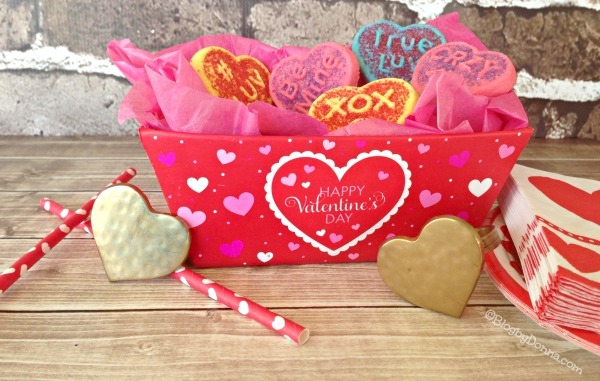 Glue your string heart onto the front of the card stock and use a marker to write something with a Valentine’s theme. 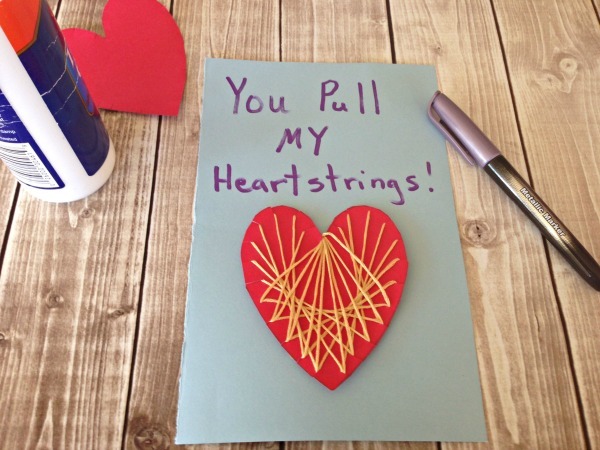 My son wrote, “You Pull My Heartstrings”. Your guests can personalize the inside of the cards the way they see fit. (This craft didn’t cost me anything because as I mentioned above, I already had all the supplies, but you can get everything I used relatively cheap at a discount or craft store). Next I was ready to come up with a game for the guests of my Valentine’s Day party. I already had Valentine’s Day themed Bingo cards from previous school parties, as well. 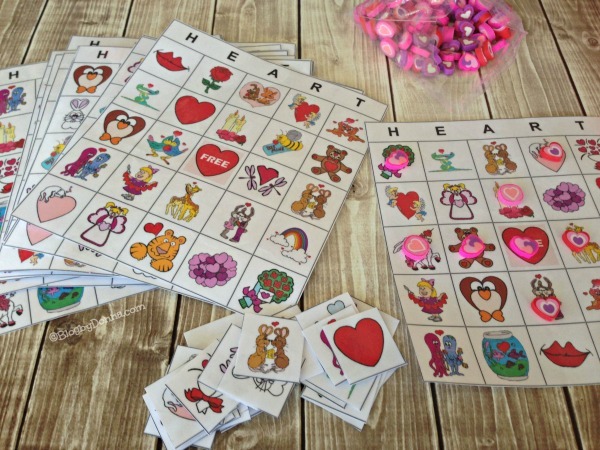 I did buy some heart-shaped erasers to use as the Bingo pieces because I’ve used conversation candy before, but I don’t like the idea of kids playing with them and then eating them. If you don’t already have V-Day Bingo cards it’s really easy. You can find several sites online where you can generate whatever themed Bingo cards you need and print them out. I bought clear contact paper (it’s cheaper) to cover my cards with instead of laminating paper. I’ve had these cards for about four years and they still look great. Finally all that was left was setting up my table for the party. I already had a cream colored table cloth and a red plastic table cloth. I took the red plastic one and wrapped it around a wooden crate I had to display the cupcakes on. I made goodie bags for the winners of the Bingo game. I also bought a few Valentine themed decorations, plates and napkins at a party supply store that were on sale. 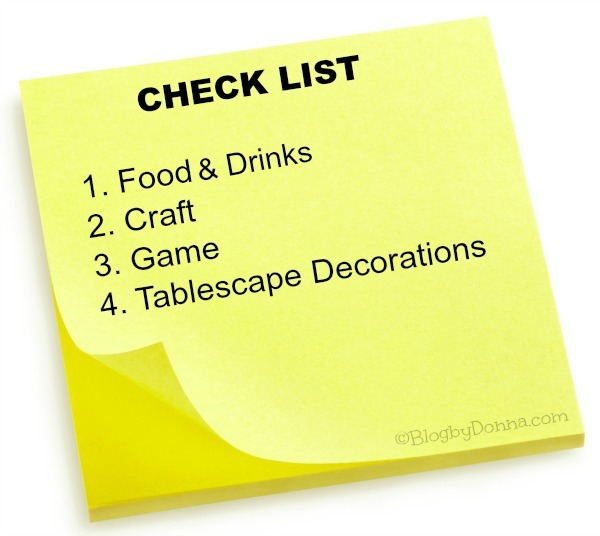 I ended up spending less than $45 on my tablescape, including food and drinks, craft supplies, game, and decorations (including a banner). You can use things you already have, make things yourself, and shop for good deals. From planning, shopping, getting my materials together, and putting my tablescape together took me less than 24 hours. 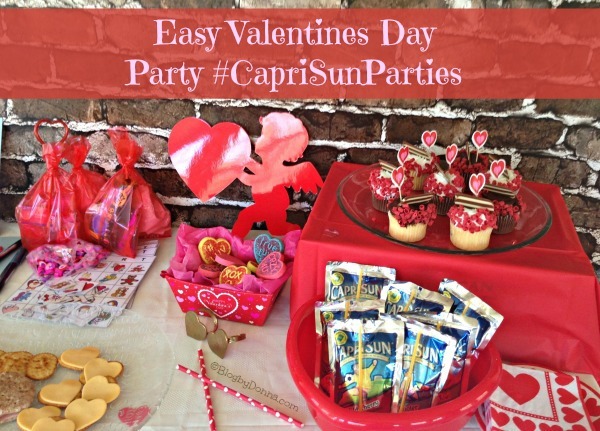 Anyone can throw an easy Valentine’s Day party… I know I’m excited to host my first Valentine’s Day party. Now I think I need to go do a taste test of the cupcakes and wash it down with a refreshing Wild Cherry Capri Sun! Love this, you are making me excited about V-Day! I have to do something for the boychild. It looks like this party would be a blast. The snacks and activities are always my favorite parts. Can’t wait to celebrate with my kiddos & their classmates! I know! I was kind of surprised at how quickly and cost-efficient it is to throw a party. As long as kids have drinks, like Capri Sun, some sweets, and a craft and game to keep them entertained, it isn’t hard to pull off! What a fun party! My son loves Capri Suns. Okay I may too…it’s totally ok that I’m 31, right? The string and heart craft turned out so pretty. I love the idea of conversation cookies too! Love all the cute Valentine’s Day treats and decorations. I don’t really put much stock into Valentine’s Day, but my husband and I’ll be going to a new Italian restaurant this Valentine’s Day. Everything turned out lovely and those cupcakes looks so yummy! My husband and I just did a “purge” of some of our storage and I found a roll of hemp string that would be perfect for the heart! I’ll get creative and make this for him for next week as we normally don’t buy each other gifts for Valentine’s Day. Gorgeous decorations! I should take these ideas to have a great Valentines! 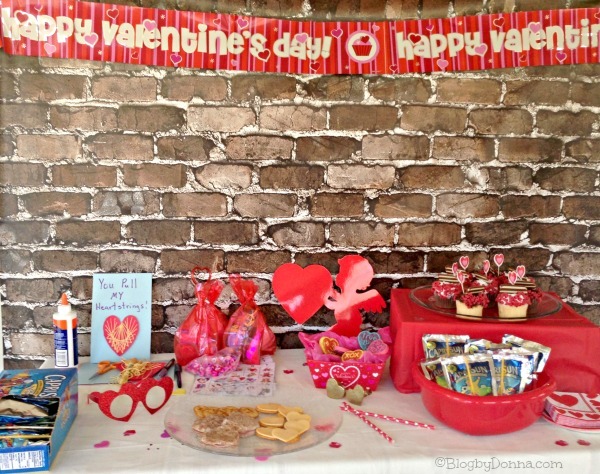 What an adorable Valentine’s Party spread. We are big fans of Capri Sun and I always buy mine in bulk at the club store. Those string heart crafts are adorable! You’ve done an amazing job, everything is adorable! This looks like fun with my nieces and nephews! You pull my string! That is so cute. I love those cupcakes they are so adorable. Really cute and fun ideas. Thank you for sharing. What a fun Valentine’s Day Party! I really like the string art craft. The ‘string art heart’ would make a great gift for a grade schooler to give to mom or dad or teacher too! I have no doubt everything you’ve done here would make a Valentine’s Day get together fun for everyone invited. I bet your party turns out great! Capri Suns are a must for my grandchildren and we get them at Sam’s too. Love the sting art. Not sure if I can pull it off but maybe I’ll try. Thanks! These are so cute! My Valentines do pull my heart strings, it would be perfect to make with them. They’re easy to do and you can’t alternate your strings anyway you want and get a slightly different look, too! 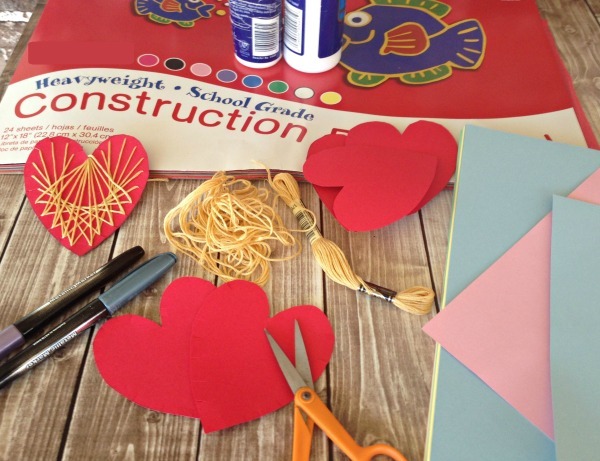 What a fun and creative Valentine’s Day party. Kids would love it for sure. Great, great, great idea! This year we are also celebrating Valentine’s Day with our kids for the first time. You’ve inspired me with this article! Thank you! Looks like a lovely day and lovely party tips! I think I could pull off a V-Day party. Thanks for showing how quick, economical, and easy it is to throw together a party! You did good!